In my last post, I showed you how to use the Test-Connection cmdlet to test your internet access. In this post, I can show you how to use Net.WebRequest or the Net.WebClient to send a request to website and verify if you have internet access or not. There is more you can do with these other than just testing Internet access or testing that a website is currently up and running, but that is beyond the scope of that I am going to show you here. The first class I will show is the Net.WebClient class to access a web page. Using this class and its associated methods will actually download the source page of the website. If you also look at the methods, you can see methods for downloading files, download data, uploading data and files. Again, this is more than what I will go into at this time, but still, it does provide some pretty cool things to do with this class. First off, lets create the object using the Net.WebClient class and view those methods. As you can see, there are a lot of methods and even some events that you can leverage when using this class. For the sake of this post, I will be going into using the DownloadString() method to use in testing a connection to a web site. Using this, I will use the DownloadString() method to download the webpage and display it in a powershell console. Keep in mind this will be displayed in a pretty un-user friendly format, but that is ok because we are only concerned whether we can actually access the site or not. Holy cow! That is a lot of wild output, isn’t it? 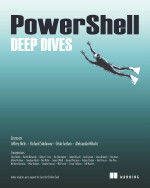 As you can see, the entire bing.com webpage has been downloaded and is now being displayed in the PowerShell console. Just for the sake of something a little bit smaller, I will run this against microsoft.com as well to show. Ok, that’s better. Again, just be seeing this information shows us that we are able to connect to the internet, and not only that we are able to access the webpage without any issues. So we know what happens when a site is active or our internet connection is active, but what happens if the connection is down? Knowing that you can use Try/Catch when making the web site connection, you can then use looping (Do Until, Do While, While) to continue to attempt a connection until it is able to do so, and then send some sort of notification when successful. Write-host -fore Red -nonewline "Access down..."
Write-Host -fore Green "Access is back"
Had I used a legit site and killed my connection and then brought it back online, you would have seen the green text stating the access was back. However, I was listening to the PowerScripting Podcast and didn’t want to miss out on listening to it. One last item on using this class for your connecting and verifying needs. This doesn’t really apply to testing the connection but is still pretty cool. This involves shows how many bytes a the webpage that you are downloading is. As you can see, it is roughly 27KB in size for bing.com. Again, pretty cool if you wanted to know just how big a page is that you are downloading to your browser. Using this class, I will show you how to get a response from a web server hosting a site. Unlike the Net.WebClient class, you will not be able to download the site page. However, with this class, you can get a response code and also see what type of web server is being used to host the site. First we will create the object that we can then use to get a response back from the web site. Since this class does not have a constructor we can use like the previous class, we will use a static method available from this class to create the object. Using the Create method also requires that we input the web site name as well. There are a few methods here to use, but the main one that we will use is GetResponse(). Using this method will return back data about the website such as the type of web server being used to host the site, the status code, description and even the size of the webpage, much like I should you could do using the Net.WebClient class and converting the output to a string and getting the length. I am not much of a web person, from some of the information given, I can see that microsoft.com homepage is approximately 1KB in size and that the web server hosting this page is IIS 7.5. One thing to note is that the StatusCode says OK. If you look at the type of object this is, you will see that it is a System.Net.HttpStatusCode object. Clicking on the link, you can see that there many members of this class that relate to different codes that a web site may return. You can convert this object into an integer to get the code by casting it as an integer. I would recommend doing this method as the StatusDescription matches the StatusCode and there is no need to have the exact same output and they can compliment each other. Assuming my network connection was down or the site itself was down, you could use a Try/Catch statement to catch the error, and in turn like using the Net.WebClient class, perform a loop to monitor that site. Downloads web page from site. 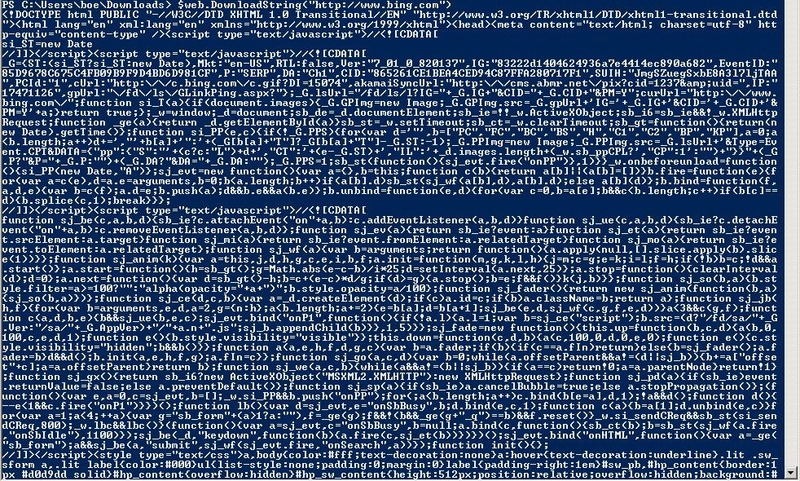 Write-Verbose "Creating web client object"
Write-Verbose "Downloading web page and determining size"
Write-Verbose "Downloading web page and displaying source code"
This entry was posted in powershell, scripts and tagged .net, Powershell, web site. Bookmark the permalink. I am trying to logon to a website and want to click a link on the new webpage after the login page. I was able to login to the main page but could not click a link on the new page. How can I get the new webpage? Can anyone help me create a code for this? What would be the reason !? I would like to run webclient object script since it is a remote machine ,which deletes files in SharePoint document library based on file type and file name. I tried multiple attempts but no luck any suggestions please ? How to enter alternate credentials? How should I call these functions with alternate credentials? I am trying to connect to our internal sharepoint website which gives me a pop up to enter credentials. 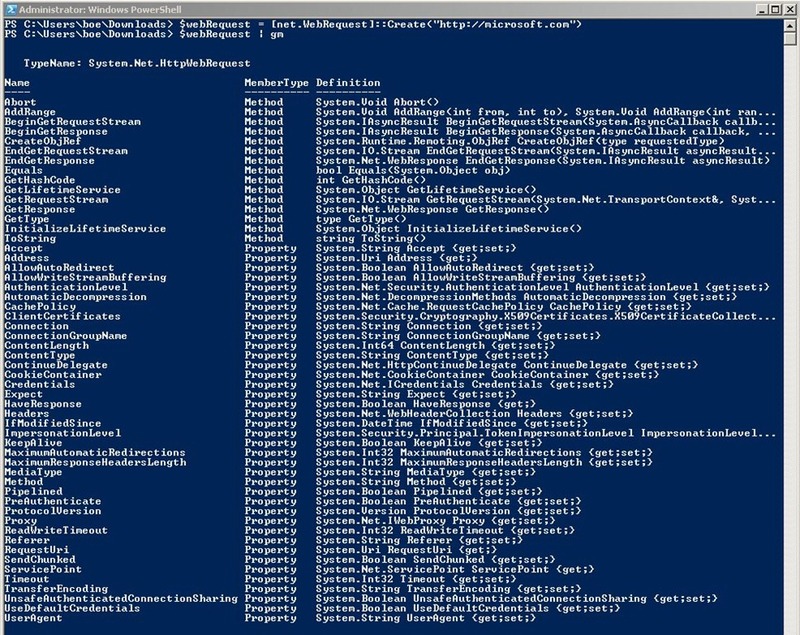 With Powershell 3.0 and higher you can use Invoke-WebReqeust. I’ve used something similar in the past, but haven’t tested this code. #$orgName=”orgName” # may or may not need this depends on your SharePoint config. I found several articles on using Add-Type -AssemblyName System.Security with the Invoke-Webrequest but I am somewhat of a novice. I can’t wrap my head around it. Excellent info. $webrequest.GetResponse() is what I needed to track down where a 301 redirect was pointing to. Thanks! This is what i’ve been doing to test separate nodes of a load balanced website. I haven’t been able to figure out how to authenticate the request, but it works for anonymous websites. If anyone can help me with authenticating the connection (similar to -usedefaultcredentials in the invoke-webrequest commandlet), or just a better solution in general i would greatly appreciate it. The Problem is that the object $wr does not exist, it should be $wc. otherwise a neat little bit of code. Glad you liked the code! Thanks also for pointing out that bug. I will be sure to update the code to reflect that bug! Good article. Is there any option to send a certificate for sites that require the user’s PKI certificate for authentication? I found this out on Stack Overflow that uses some inline C# code to allow a certificate to be added to the web request. Not sure if it is exactly what you are looking for. I will do some more research to see if there are other options. 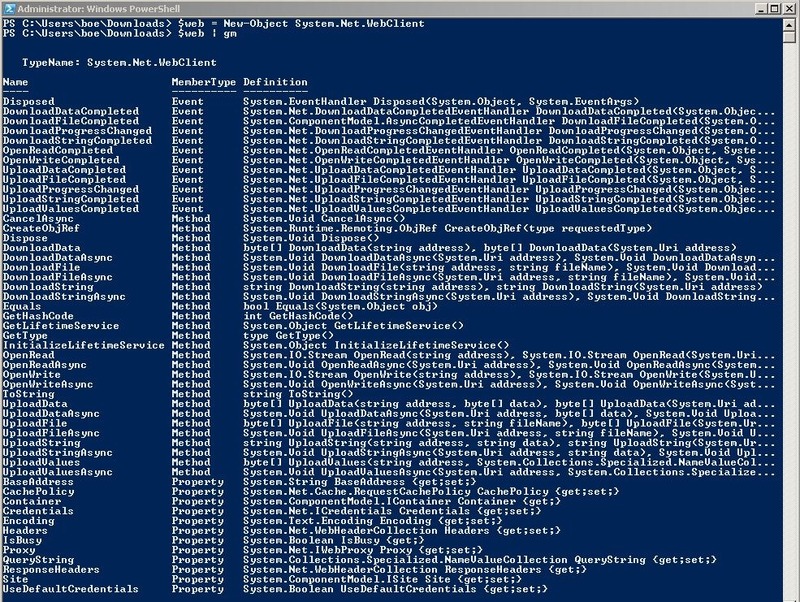 I am very new to powershell…….Can someone help me how to write a powershell script to find out a particular content in a webpage…… say i am looking for a “” tag for example. Firstly, I am new to programming and scripting. If i browse to the same url using mozilla it works fine. Although I do need to accept the invalid security certificate and this device needs authentication. How can i work around this? Sometimes you have to set the UseDefaultCredentials to True for a secure connection. Thank you for starting at square one! I had some of this down, but was missing the UseDefaultCredentials = $True. I have been trying to locate the fault but sofar no succes. When you save the code to a script, such as Get-Webpage.ps1, do you then dot source the script. By that I mean from the PowerShell console, you type . .\Get-Webpage.ps1 to load the function into memory. Once you do that, then you will be able to call the Get-Webpage function. Seems to be a clear oops. Copy/paste left a line from a previous script. Your script works great. THX. Excellent write up. Can’t wait to try these out. Thanks for sharing! Thank you. I appreciate the comment and that you found this article useful.